Beat the Fish at DuckPoker With a No-Deposit Bonus! Have you checked out DuckPoker yet? And if not, what's your excuse?! Maybe you are just hearing about DuckPoker now, since this is a relatively new poker room where, instead of playing against many ducks like the site name suggests, you have the luxury of playing against a whole school of fish. You may be asking yourself how the games could be easier at DuckPoker than almost anywhere else. Two reasons are that either the sharks haven't heard about the site yet or that they would rather play for higher stakes on other poker rooms. Perhaps the best reason that even beginner players can win at DuckPoker is that casual players flock to the site due to the room's great promotions, the around-the-clock freerolls, and the friendly appeal of the games and site. If playing against fish isn't enough for you, how about a free $25 in tournament bucks to sweeten the pot? $5 of this tournament money doesn't even require a deposit! 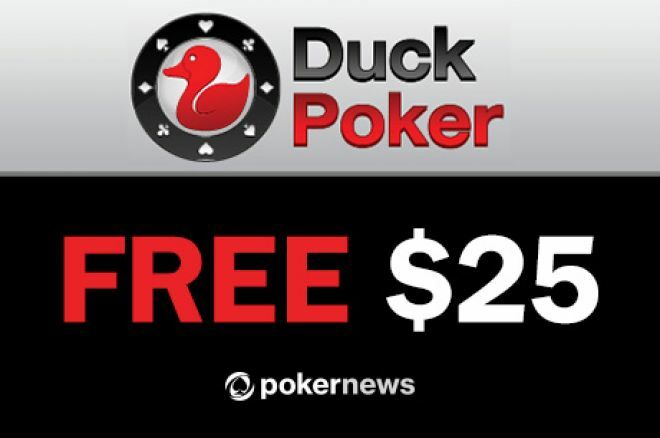 To get your hands on $25 in tournament money, just download DuckPoker through PokerNews Canada, and use our special bonus code "PN25". Immediately after the registration, you will receive a gift of $5 in tournament money to see for yourself how great the games are at DuckPoker before you decide whether to make a deposit or not. You can help yourself to another $20 more in tournament money just by making your first deposit. When making a deposit, $5 in tournament money will be immediately yours, while another $15 can be yours just by playing some of the great games at DuckPoker and earning Player Points. $5 in tournament money will be released for every 30 Player Points. The entire bonus can be yours when you earn 90 points. DuckPoker won't be giving away free money forever. So hurry up and start fishing for big money with a free $25 in tournament dollars as soon as you can and download DuckPoker through our links today! Click here to read about the terms and conditions of this promotion. [UPDATED] Join the PokerNews-Exclusive 'Spin & Go Special' Freeroll on PokerStars!